The first generation iPhone was, in many days, quite different than the ones we see in use today. For one thing, it was small, just 4.5 inches by 2.4 inches. It had no third-party apps and topped out at 16GB of flash memory. It was exclusive to AT&T, and ran only on AT&T's notoriously slow and unreliable EDGE GSM network. But despite all of its shortcomings, relative to today, that first iPhone was hugely important. It was Apple's entry into a new category, at a time when the company's singular handheld device was the iPod. The iPhone was the debut of the touchscreen, which would soon become standard in the category. Sure, there had been smartphones available from established manufacturers before, but they had physical keyboards and a much smaller screen. In the fourth quarter of 2006, the year before the iPhone was announced, 22 million smartphones were sold worldwide, according to Canalys data, and about half of those devices were by then-market leader Nokia. RIM, the BlackBerry maker, was second in share, followed by Motorola, Palm and Sony Ericsson. Smartphones at the time resembled the Motorola Q or the Samsung Blackjack —a small, rectangular, handset, with a screen on top and buttons on the bottom. That began to change, however, in January 2007, when the first iPhone was announced. The launch of the iPhone was greeted by quite a few doubters. Then-Microsoft CEO Steve Ballmer said in an interview at the time that the iPhone had "no chance" of taking over the smartphone market. "There's no chance that the iPhone is going to get any significant market share," Ballmer told USA Today in April of 2007. No chance. It's a $500 subsidized item. They may make a lot of money. But if you actually take a look at the 1.3 billion phones that get sold, I'd prefer to have our software in 60% or 70% or 80% of them, than I would to have 2% or 3%, which is what Apple might get." Ballmer admitted to Bloomberg in 2016 that he had been wrong, and that Microsoft had jumped into smarphones too late. Ballmer wasn't alone. The then-CEOs of BlackBerry maker Research in Motion, Mike Lazaridis and Jim Balsillie, watched the iPhone unveiling in disbelief. According to a Wall Street Journal excerpt of "Losing the Signal," a book about RIM's rise and fall, Lazaridis pointed out, accurately, that "these guys are really, really good," while Balsillie said (not so accurately) that "it's OK—we'll be fine." There were doubters in the media, as well. "We Predict the iPhone Will Fail," a Techcrunch contributor wrote. TUAW now Engadget rounded up complaints about the phone, with AdAge expecting the device to fail as well. Steve Jobs had reportedly eyed using touchscreens on Apple devices as early as 2005. Following the failed experiment of the Motorola ROKR, a phone that came equipped with iTunes, Apple decided to develop its own phone, which would incorporate the iPod's musical functions into a smartphone. The iPhone was announced during that year's Macworld event in San Francisco, on January 9, 2007. "This is a day I've been looking forward to for two-and-a-half years," Jobs said in the keynote. 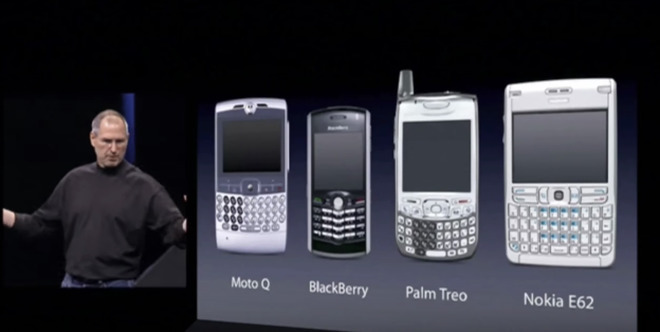 He went on to point out the leading smartphones of the time — the Motorola Q, the Palm Treo, the the Nokia E62, and the BlackBerry — and to trash them, compared to his new product. "They all have these keyboards that are there, whether you need them or not to be there, and they all have these controls buttons that are fixed in plastic and are the same for every application." said Jobs. "What we're going to do is get rid of these buttons and replace them with a giant screen." The original iPhone reached the market on June 29, 2007. In the U.S. it was priced at $499 and $599, for 4GB and 8GB models, respectively, along with a two-year contract with AT&T. The first iPhone ran on what was then called iPhone OS 1, as the iOS naming convention wouldn't be adopted until 2010. It boasted only Apple's native apps, as third-party applications wouldn't be available until the App Store launched along with the iPhone 3G a year later. The initial iPhone received mostly positive reviews. "As it turns out, much of the hype and some of the criticisms are justified," David Pogue wrote in the New York Times. "The iPhone is revolutionary; it's flawed. It's substance; it's style. It does things no phone has ever done before; it lacks features found even on the most basic phones." "Despite some flaws and feature omissions, the iPhone is, on balance, a beautiful and breakthrough handheld computer," Walter Mossberg wrote in The Wall Street Journal's All Things D. "Its software, especially, sets a new bar for the smart-phone industry, and its clever finger-touch interface, which dispenses with a stylus and most buttons, works well, though it sometimes adds steps to common functions. Apple sold 1.9 million iPhones in 2007, according to Statista. By contrast, they sold 216.76 million iPhones in 2017. It took Apple a few years to earn a dominant market position, as the device improved, it added more features, and it became both more affordable and available on more carriers. The iPod Touch, which brought touchscreens to the iPhone, arrived later in 2007, while the iPad followed in 2010. The original iPhone's successor, the iPhone 3G, arrived the following year, adding 3G functionality, apps and more; the first iPhone was discontinued the same week. Apple declared the first-generation iPhone "obsolete" in June 2013, prior to the unveiling of the iPhone 5 and 5S. 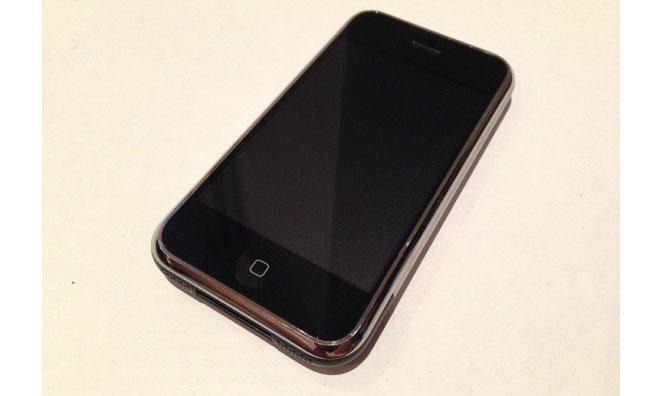 A prototype of the first-generation iPhone sold for $1500 on eBay in 2013. The first iPhone is primarily remembered as the product that set Apple on its current course, as a company in which the iPhone is the product line that both sells the most and is most important to the company's bottom line and financial health. Before it, almost no mobile devices had touchscreens; now, nearly all of them do. That original iPhone sold just over 6 million in its first year. While current iPhone sales significantly outpace that number, the first iPhone's legacy is secure as one of the most important products in Apple history.